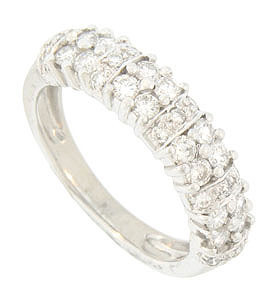 Dazzling round cut diamonds adorn the face of this 14K white gold wedding band. The fine faceted diamonds are set in a pattern of floral quartets separated by pairs of vertically set diamonds. The distinctive setting features elongated prongs and bold milgrain to bring added drama and sparkle to this spectacular wedding ring. 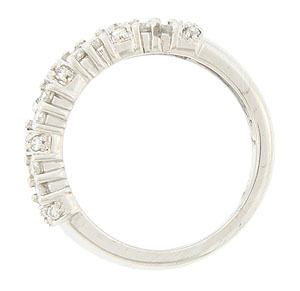 The antique style ring measures 4.83 mm in width. Size 6 1/2. We can re-size.